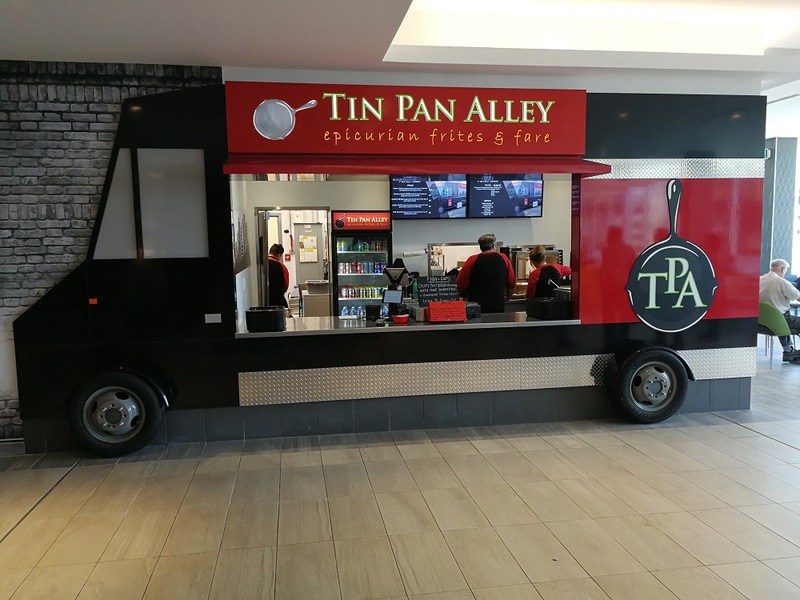 Tin Pan Alley is a food-truck-turned-food-court-kiosk (themed after a food truck) in Scotia Square Mall, which is itself basically a glorified food court. Still with me? The speciality here is Dutch-style frites, fashionably served with steak, butter chicken, duck confit and the like. 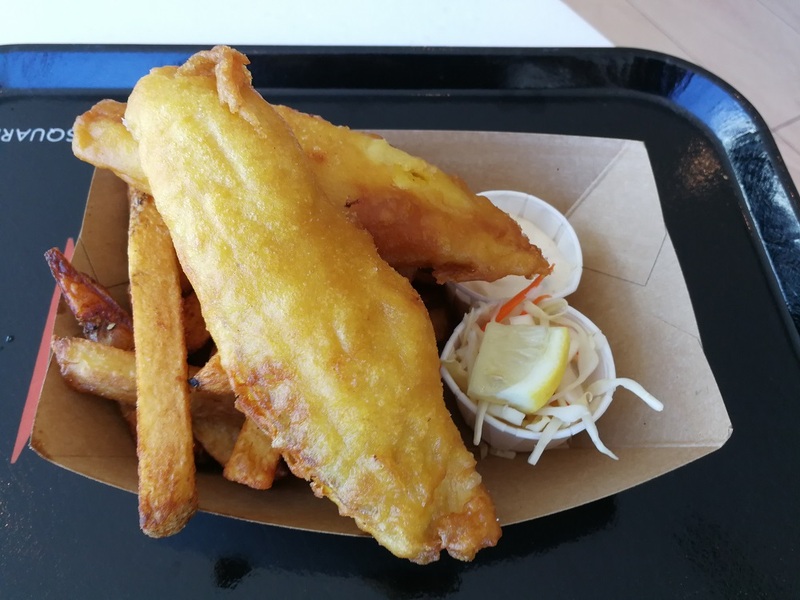 I’ve been a fan of their Steak Frites since I had a chance sighting at Grand Parade Square once upon a time, and NOW I hear they are making fish ‘n chips and that I should try them. Tin Pan Alley started with “Fish Fridays”, selling only 20 pieces a day. Now it’s on their daily menu and has quickly become the best seller! 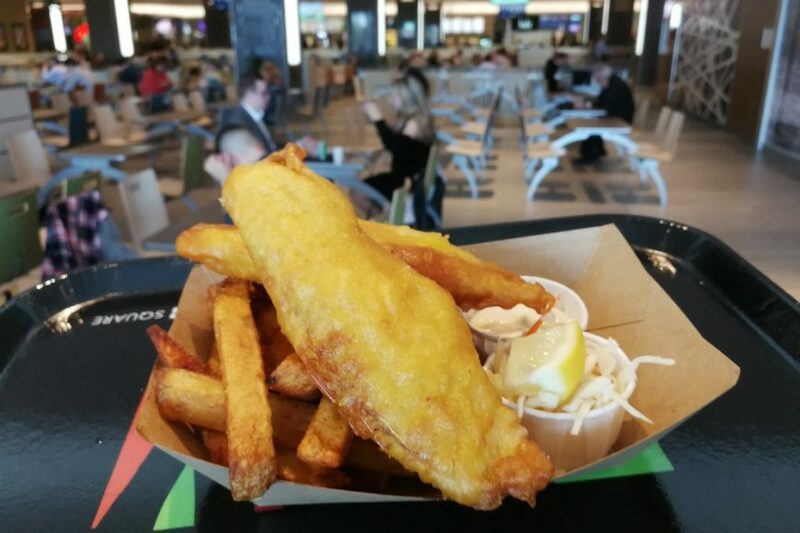 LuShark and I split a 2pc fish ‘n chips ($10) which is a steal! It even includes little paper cups of tartar sauce and coleslaw (and you can spray on your choice of vinegar at the counter). Two medium-sized haddock fillets are piled on top of a modest serving of plump, potatoey fries. What these fries lack in quantity, they make up for in heartiness! I wouldn’t want to eat much more beyond this portion. 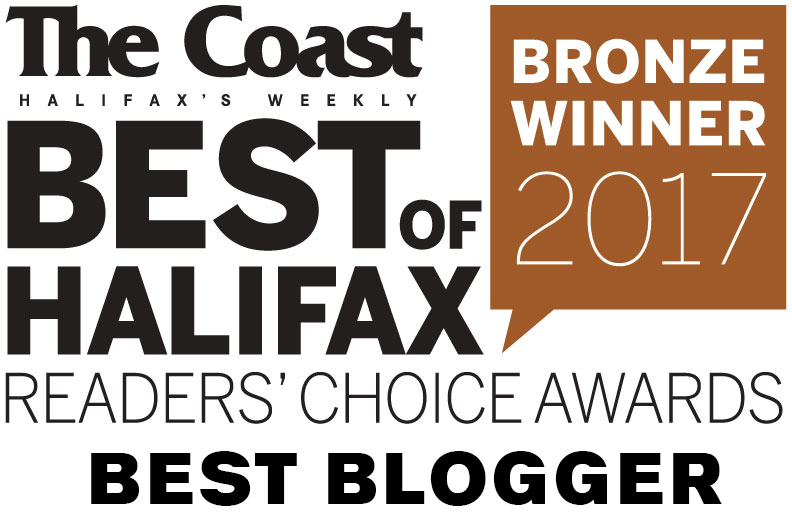 Meanwhile, the tartar sauce is some of the best I’ve had, and the coleslaw, while simple, was fresh and did its job. Tin Pan Alley prefers to use a thick and chunky fillet of haddock. This particular fillet was domestic-frozen-at-sea, but supply varies; the owner tells me he’s looking into fresh local and other frozen-at-sea products to ensure consistency and quality. The batter was perfectly crispy and perfectly seasoned. 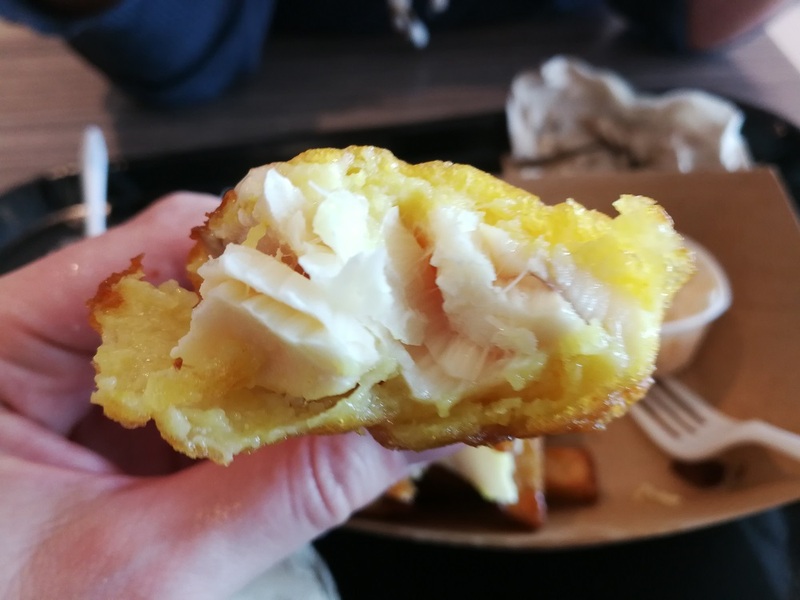 It contained the fish without falling apart, nor was it too chewy or greasy or mushy. We inquired about its yellow hue and were told they spike the batter with turmeric! Fancy that! This is some of the best fish ‘n chips I’ve had in a long time!!! The only thing missing is an ocean breeze, but as far as food courts go – the view out of the newly renovated windows ain’t bad. 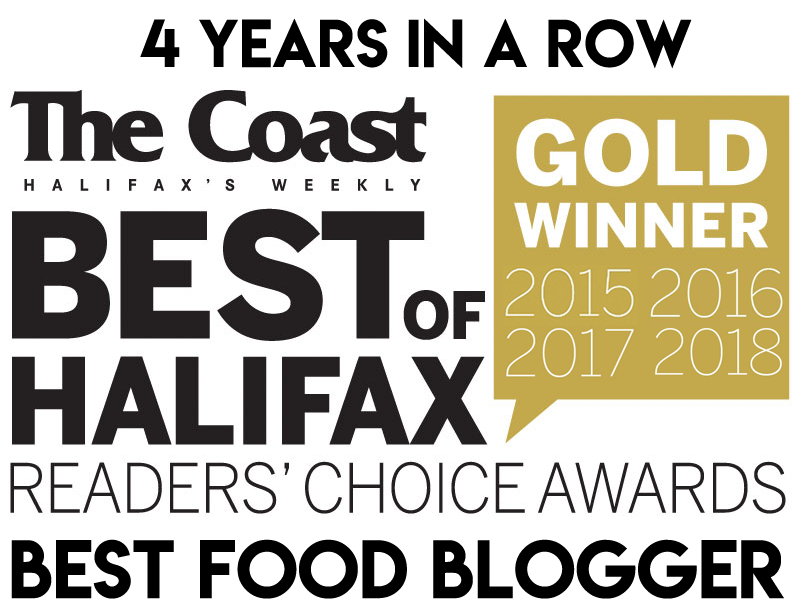 The Scotia Square Food Court is known as being the best in the city, where family-run gems exist alongside the increasing presence of chains. Tin Pan Alley holds its own in the former category and their fish ‘n chips game is superior to any waterfront trap. You need to come back to Tin Pan Alley for the ribs or the Grilled BBQ Pork – pretty damn amazing stuff…. And the Beef Salpicao is absolutely devine….